The Houston Claims Association is a non-profit organization dedicated to providing continuing education required by the Texas Department of Insurance to licensed insurance professionals and providing educational scholarships to its members' children. The continuing education hours are offered through monthly luncheon meetings and half-day seminars. Programs are held on the second Wednesday of each month except for July and August. One hour programs (January March, April, September, and December) will be at The Palm, 6100 Westheimer Road. Half day (4-hours of CE credit) seminar locations (February, May, June, October, and November) will be announced. The date is set and good weather has been ordered for the HCA Spring Golf Tournament. 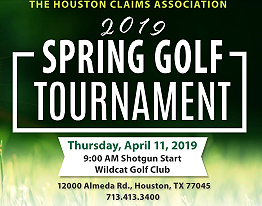 Mark your calendars for Thursday, April 11, at Wildcat Golf Club, 12000 Almeda Road, Houston 77045. Flyers will be out soon. Look for the new options for this event!! NO ON-LINE REGISTRATION AVAILABLE. This event benefits the HCA Scholarship program and MD Anderson Children's Card Project. We are looking forward to your joining us.